We made a PhD! But what's a PhD good for? Research labs don’t just generate new science; we also produce new scientists! Our most lasting and important impact will be through the trainees who pass through the lab. Rajiv in his armoured suit presenting 5yrs worth of work in 40 min. 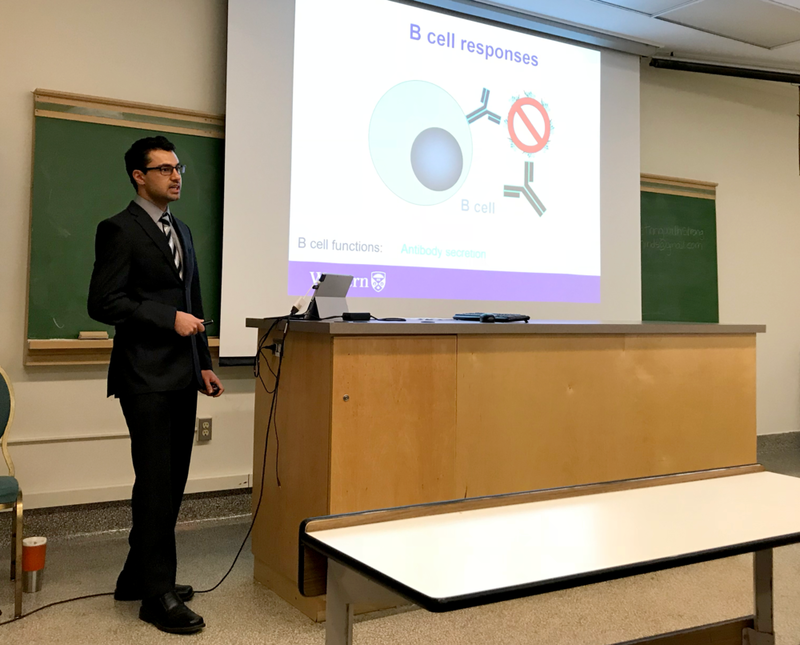 We’re very excited that Rajiv has successfully defended his PhD thesis and is now Dr. Jain! During his time here, Rajiv developed several new techniques and reagents that will continue to be important to our lab’s research for years to come. His primary project, which focused on understanding how T cells control B cell responses to different antigen targets, and how properties of those antigens themselves influence immune outcome, has just been accepted for publication and we’ll talk more about it soon. The rest of the team claims some of the credit (and cake). Rajiv is now planning his next steps to continue his training as a Post-Doctoral Fellow. He’ll tell you more about that himself in an upcoming post. Post-Doctoral training is an opportunity to learn new techniques, branch out into a new field of research, and gain more experience and independence. It’s often a necessary step for the next stage in a science career, whether that be in academics, industry, or something else. In fact, most PhDs go on to use their science training outside of academia. Signed proof Dr. Jain has completed his thesis to the satisfaction of his supervisor and exam committee. It’s becoming all too real: Rajiv’s empty desk and pile of lab books. We’ll miss you Rajiv! PhD’s are sometimes accused of been over-specialized, and not useful outside of their niche specialty. Nothing could be further from the truth. During their PhD program (and Rajiv is an excellent example), students train to and become adept at thinking creatively to ask new questions and solve new problems; develop new approaches to overcome unforeseen hurdles; troubleshoot issues as they arise; become technically expert in hands-on procedures; to develop and adapt procedures to new uses and environments; to quickly become expert in a new topic that unexpectedly becomes important to their project; to clearly communicate highly complex and technical topics through different media, including written papers, oral presentations, and visual figures; to train and mentor more junior students; and to collaborate with other experts to solve important problems. What industry would not value such highly flexible and broad expertise? Up for a challenge? We’ll be looking for our next PhD trainee soon. It could be you! Over the next few months we expect to start the search for our next PhD student. If you’re considering your own next steps and willing to take on a challenge (and it is a challenge), PhD training can be a great entry point into many careers.